Name of a treatise of the Mishnah, Tosefta, and the Palestinian Talmud. It belongs to the order Zera'im, and deals with the exact definition of the Pentateuchal prohibitions (Lev. xix. 19; Deut. xxii. 9-11) which forbid the mingling of different kinds of seeds and vegetables, the pairing of different kinds of animals, the mixture of wool and flax in the same garment, etc. In the Mishnaic order this treatise is the fourth, and is divided into nine chapters, containing seventy-seven paragraphs in all. Ch. i.: Enumeration of the different sorts of grain, legumes and other vegetables, herbs, and trees, which do not constitute kil'ayim together (§§ 1-4); herbs and animals which do form kil'ayim (§§ 5-6); how the different trees form kil'ayim with one another and with plants, and how the plants form kil'ayim with one another (§§ 7-9). Ch. ii. : What is to be done when different seeds are mixed; concerning the merging of one variety in the other (§§ 1-2); what must be done when one desires to plant grain in a field already sown with different grain, or to plant trees in a grain-field (§§ 3-5); the distances to be observed between the different beds, when one wishes to plant different things in separate beds in the same field (§§ 6-11). Ch. iii. : Of the distances between beds of cabbage, onion, and other vegetables (§§ 1-6); of the distances between grain and herbs (§ 7). Ch. iv. : Of vineyards: how large a space must be left in the middle of the vineyard or between the vineyard and its hedge if other seed is to be sown here (§§ 1-3, 8-9); how the hedge must be made, so that one may plant outside it (§ 4). Ch. v.: The vineyard continued: cases in which a ruined vineyard may still be used (§§ 1-4); how far the herbs in a vineyard spoil the taste of the wine (§ 5); what herbs must be removed from a vineyard when they grow wild there, and the cases in which this must be done (§§ 6-8). Ch. vi. : The vineyard continued: concerning the vine-rows, and the leaning of a vine against a tree that bears fruit or one that bears no fruit. Ch. vii. : Vines and cuttings: vines which do not spoil the grain, although one may not plant the two together (§§ 1-3, 7-8); payment of damages for spoiling another's grain by planting vines (§ 4). Ch. viii. : How far the various forms of kil'ayim are forbidden (§ 1); animals which constitute kil'ayim and may not, therefore, be harnessed together either to the plow or to carts (§§ 2-4); concerning hybrids and other animals (§§ 4-6). Ch. ix. : Kil'ayim of clothing: goods or stuffs which constitute kil'ayim with one another (§§ 1-2); articles of clothing forbidden on account of kil'ayim (§§ 3-4); concerning clothes-dealers, tailors, and imported ready-made clothing (§§ 5-7); explanation of the word "sha'atnez" (Deut. xxii. 11); how stuffs must be sewed together to become kil'ayim (§§ 8-10). In the Tosefta, Kil'ayim is the sixth treatise, and is divided into five chapters. 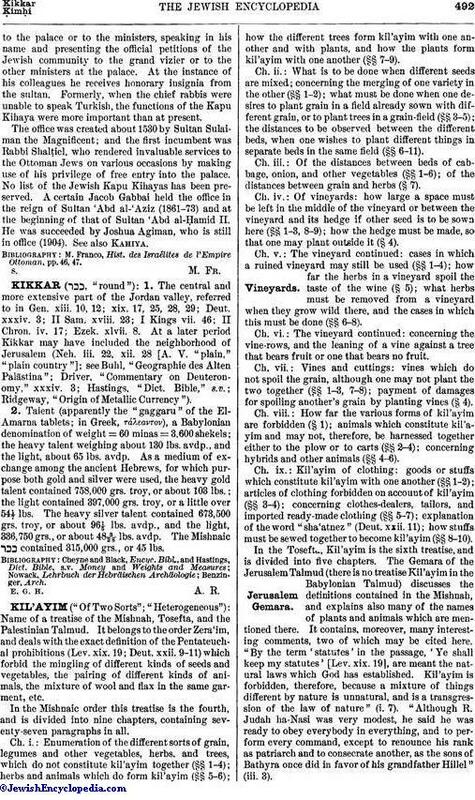 The Gemara of the Jerusalem Talmud (there is no treatise Kil'ayim in the Babylonian Talmud) discusses the definitions contained in the Mishnah, and explains also many of the names of plants and animals which are mentioned there. It contains, moreover, many interesting comments, two of which may be cited here. "By the term 'statutes' in the passage, 'Ye shall keep my statutes' [Lev. xix. 19], are meant the natural laws which God has established. 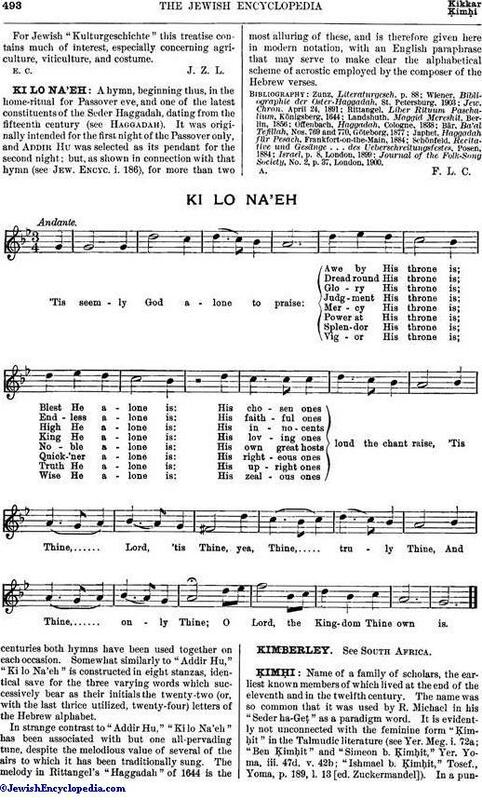 Kil'ayim is forbidden, therefore, because a mixture of things different by nature is unnatural, and is a transgression of the law of nature" (i. 7). "Although R. Judah ha-Nasi was very modest, he said he was ready to obey everybody in everything, and to perform every command, except to renounce his rank as patriarch and to consecrate another, as the sons of Bathyra once did in favor of his grandfather Hillel" (iii. 3). For Jewish "Kulturgeschichte" this treatise contains much of interest, especially concerning agriculture, viticulture, and costume.